The Philippine peso is weak, touching around 12-year lows against the U.S. dollar. Is it a sign of economic trouble to come? Credit Suisse comes in on the side of trouble ahead. “Quite simply, we think monetary policy is still too loose even after factoring in a hike in March,” the bank said in a note on Friday. It forecast inflation would test levels above 4 percent in coming months, before peaking in the third quarter at around 4.5-4.6 percent. Credit Suisse said that the decision by central bank Bangko Sentral ng Pilipinas (BSP) to not hike in February despite inflation threatening the upper bound of the 2-4 percent target range, coupled with the recent surprise reserve requirement cut, is raising the risk that the Bank will be behind the curve. “The risk is that BSP will be forced to tighten much faster in the future to contain inflation, weakening growth and domestic assets in the process,” Credit Suisse said. 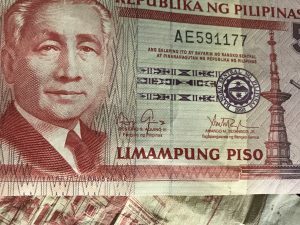 It raised its forecast for the USD/PHP to 53.0 in three months and 54.0 in 12 months, from expectations for it to stay flat around 51.2 previously. “We think any rally towards 51.5 will present an opportunity to accumulate PHP shorts,” it said. On the flip side, Capital Economics took a more sanguine view of the impact of the peso becoming the worst-performing emerging-market currency this year, after the Argentine peso. For one, Capital Economics’ economist Gareth Leather pointed to the reason that the peso had dropped so sharply: mainly a surge in imports, which widened the country’s trade deficit and helped push the current account into deficit. But Leather said the current account deficit is broadly positive. He noted that the country’s poor infrastructure has been a drag on economic growth. As for the weaker currency bringing debt-servicing problems, Leather noted that the Philippines has total foreign currency debt of around 30 percent of its gross domestic product (GDP), which is relatively low compared with other emerging markets. He was also doubtful that a weaker peso would spur inflation in the country as it has a relatively low level of total imports. Capital Economics doesn’t expect the BSP to hike interest rates this year. The USD/PHP was at 51.841 at 4:58 P.M. SGT.